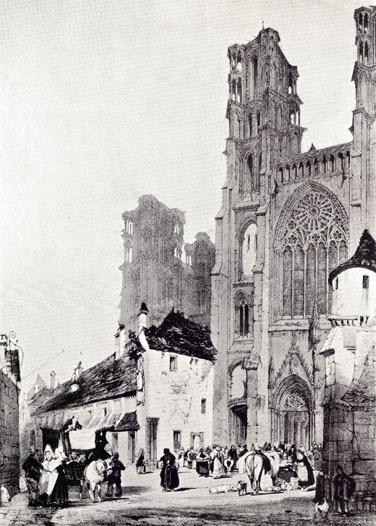 Laon: The Cathedral, from Beautiful Buildings in France and Belgium by C. Harrison Townsend, pre-WWI picture by T. S. Boys. From, Beautiful Buildings in France & Belgium, Including many which have been destroyed during the war. Reproductions in Colour and Monochrome from rare old Prints and Drawings, by and after Prout, Boys, Coney, W. Callow, David Roberts, C. Wild and others, with descriptive notes, by C. Harrison Townsend, F.R.I.B.A. ; New York: The Hubbell Publishing Co., 1916; pp. 118-121. ROWNING an isolated hill which rises abruptly some three or four hundred feet above the surrounding plain, and on which the town itself lies spread, the Cathedral of Laon lifts high its cluster of towers and spires. The building is one of the most important architectural creations of the XIIth and XIIIth centuries. Its West front is flanked by two towers, which rise to the height of the base of the spires, while both of those of the North transept and one of the South transept are complete. The six towers had, as seen from the plain and the banks of 120 the little river Ardon, a highly picturesque effect; but,lying as the town does within the war zone, it offered too tempting an objective to the German gunner, and has suffered lamentably.